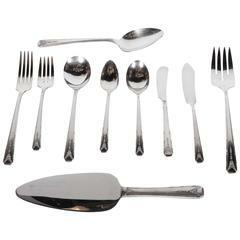 New, unused Dinner Size America by Christofle France silver plate flatware set of 74 pieces. 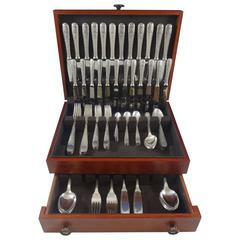 This set includes: 8 dinner size knives, 9 1/2" 8 dinner size forks, 8" 8 regular/dessert knives, 7 3/4" 8 regular/dessert forks, 6 3/4" 8 teaspoons, 5 3/8" 8 hollow handle butter spreaders, 6 1/2" 8 large dinner spoons, 8" 8 demitasse spoons, 3 7/8" 8 fish knives, 7 3/4" 1 roast carving set, 2-piece, 13" & 10 3/4" Includes bonus brand new storage chest. Pristine unused condition. No monograms. Most pieces are still in the factory sleeves. This is a rare opportunity! In the Roaring Twenties that followed the First World War, America was the country whose music, literature and lifestyle made it synonymous with modernity in the eyes of the world. 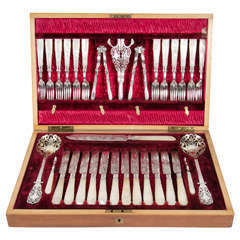 As a tribute to all these symbols, Christofle named this Art Deco pattern América when it launched in 1933. 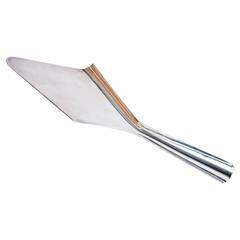 Its angular corners, beveled edges and pure, masculine lines are inspired by the architecture of the 1930s. 100% satisfaction guaranteed!